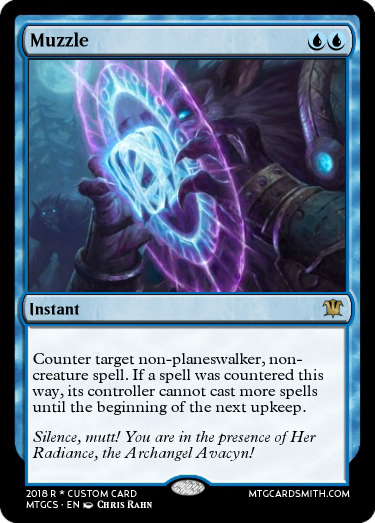 For this challenge, your task is to show me your best 2 Mana Counterspells . 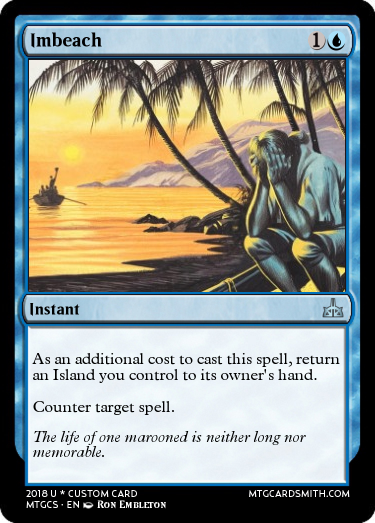 2)	Must be a blue instant with a converted mana cost of 2. 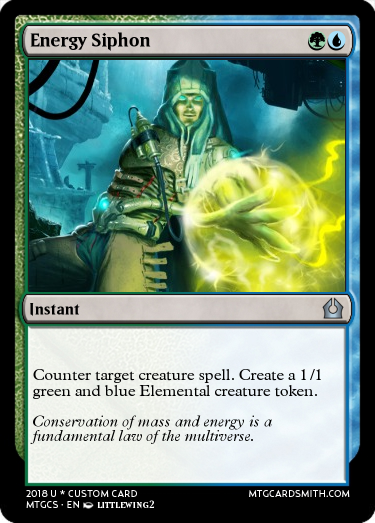 It can have other colors and / or card types in addition to being a blue instant. 3)	No spells with X in their cost. 4)	Must have the text “Counter ______ spell” . 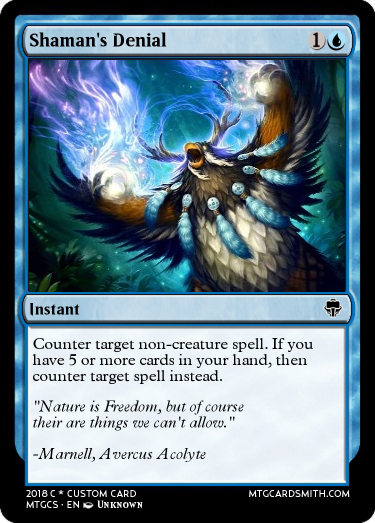 It can counter subsets of spells as well (for example, “Counter target noncreature spell”) or counter multiple spells. 5)	Old and new entries allowed. 8)	10)	Must be balanced for standard and limited play. Here are three examples of my own design. 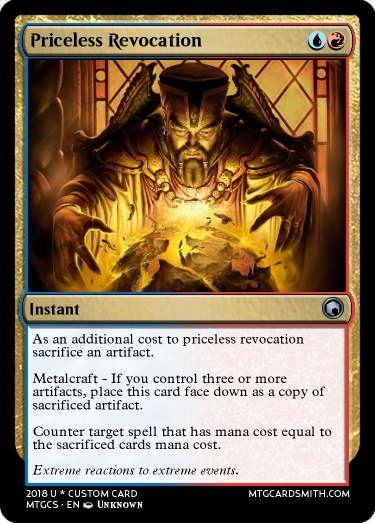 The card should formatted like a real magic card, using the correct phrasing, grammar, and punctuation. 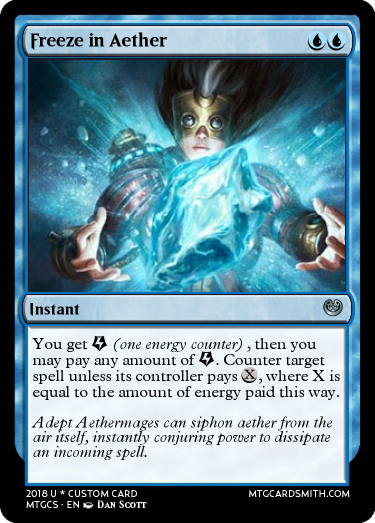 The card name, flavor text, color, and mechanical identity should align with each other and make sense for a counterspell. 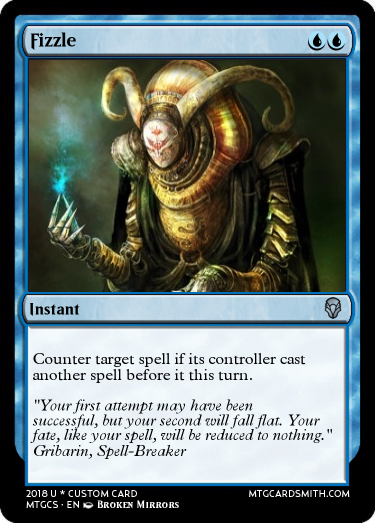 The card should be an example of a well-designed counterspell. It should demonstrate some novel characteristic. The card text should play well and be playable without being broken. The card should NOT be broken/overpowered in the standard format. The 6 examples I provided above are at the correct power level. The card should be costed appropriately for the effect. The card should have an appropriate rarity for limited play. 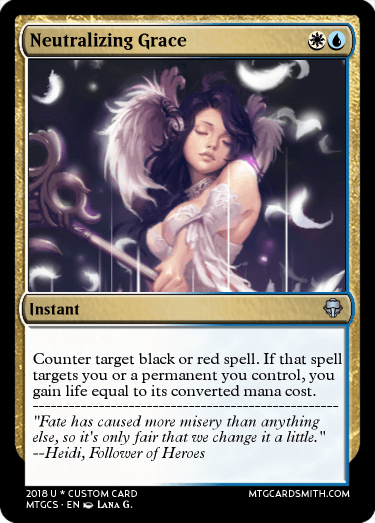 It should not be oppressive in draft/sealed (like the Scarab God, Pack Rat, Umezawa’s Jitte). It should also be appropriately costed for Limited. The card should create a healthy play pattern. It should not create repetitive play patterns. It should be fun to play and create meaningful decisions. I will not make the score breakdown for the entries public (only the final score for the winners), but you can private message me after the challenge ends for your overall score and some feedback on your card if you desire. This contest will close at 4:00PM EST on Wednesday, September 5th. If you have any questions, feel free to post them to this thread. I feel that it gives both players the ability to strategize. 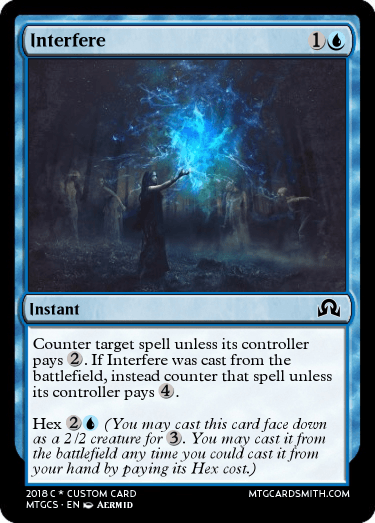 The player who's spell is being countered can decide if they want to try and waste more of their opponents Mana and the player countering the spell can also decide of the spell is really worth countering. Here is one I made a bit ago. It is based off of Swans of Bryn Argoll. 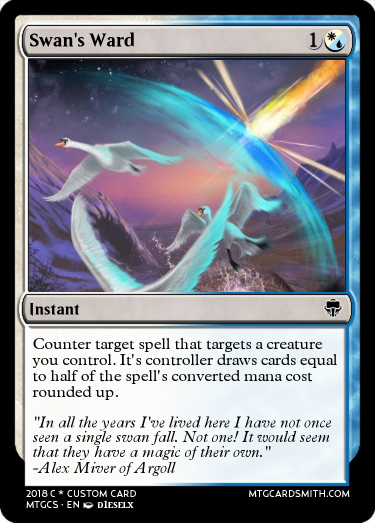 What if our spell doesn't target the other spell? We'll likely be making a card later today. But if we're busy, it will be up tomorrow! Oh dear! So much pressure when all of the criteria is set out! Makes me nervous! @Fallen_Lord_Vulganos Your card doesn't work. They imedietly recast it. 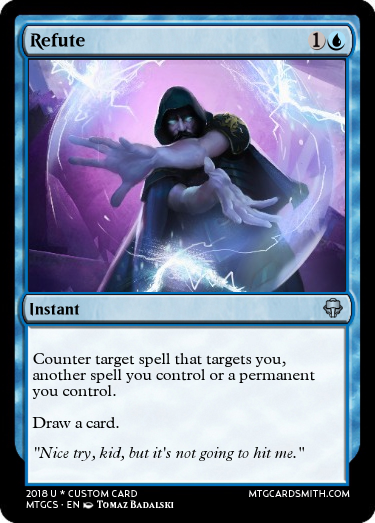 Maybe give the spell split second? @Bobman111 but they still have to pay for it again, so it's at least a remand without the draw. 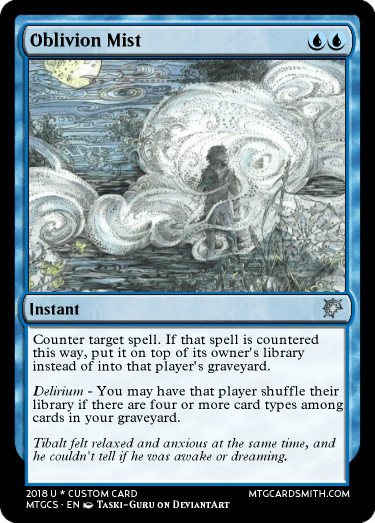 It can also be used on your own spells to make any spell instant cast. 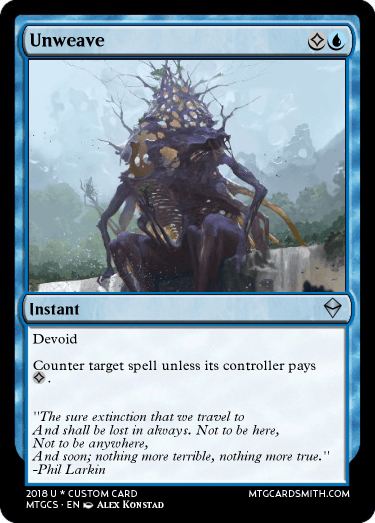 Although, @Fallen_Lord_Vulganos, it doesn't fit into the contest because the rules say it must say "Counter [blank] spell"
"2)	Must be a blue instant with a converted mana cost of 2. It can have other colors and / or card types in addition to being a blue instant." @TenebrisNemo Fine whatever. Not gonna make entries again anyway. The spell of demon and their followers. Okay whatever. I changed my mind. 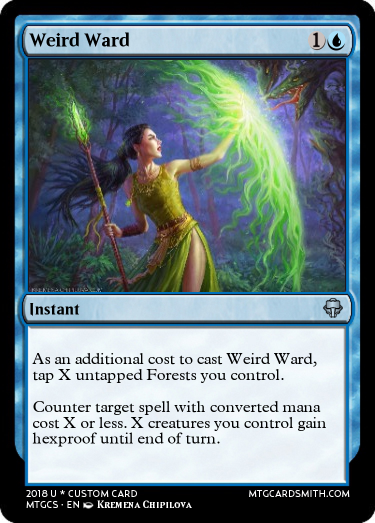 So here's an uncreative counterspell instead. To come or bring something out of the water and onto the beach. To maroon upon a beach for dishonesty or invalidity.